Optimize your Page so that it shows up at the top of Facebook’s internal search results, as well as your favorite search engine. A poorly indexed Page can result in a lot of missed opportunities because visitors just can’t find your Page. Facebook users can also leverage the trillions of connections (that is, the so-called social graph) in their search queries of content that’s been shared with them to produce a narrow spectrum of results. For example, users can search for Rock Music listened to by teachers or Books liked by people who like Led Zeppelin. 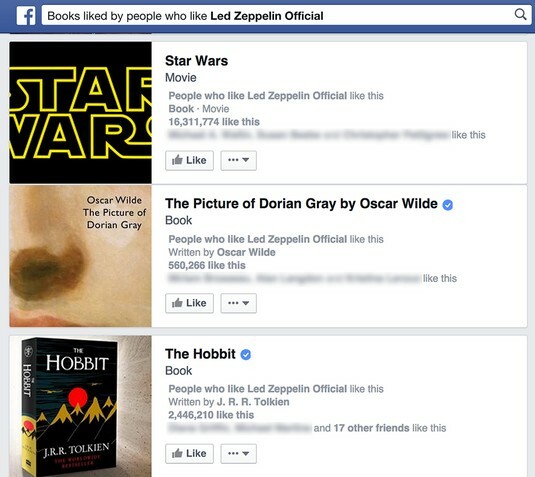 Facebook’s graph search displays books liked by Led Zeppelin fans. If other users have chosen to make their content available to everyone, members also can search for their status updates, links, and notes, regardless of whether they’re friends. Search results continue to include people’s profiles as well as pertinent Facebook Pages, groups, and apps. Users can also filter the results so that they see only posts by friends or public posts. Pages hosted by Facebook tend to rank well in search engines, including Yahoo! and Google, particularly when users search for businesses or people. In addition to making your content easy to find on Facebook, consider making your content easy for Google and other search engines to find and index. Play the name game. Choose your Page name and username wisely. A pizza shop named Pete’s Pizza will get buried far down in search results, but naming your Page something like Pete’s Pizza-Minneapolis will bump you to the top of the search results for people who are looking for pizza in Minneapolis. We have the best New York–style pizza, the hottest wings, and the coolest staff in all the Twin Cities! Stop by one of our three metro locations: St. Paul, Minneapolis, or our newest shop near the Mall of America in Bloomington. Use custom content. Use iframes or HTML. Include relevant keywords that complement your description and Info sections. Include relevant links in the code. Pete’s Pizza staff enjoying some pizza with the kids at Main Street Elementary School. Exploit plug-ins. Add one or more of Facebook’s Social Plugins to your website or blog. Integrate Facebook buttons, Share buttons, and Like buttons to increase the number of links to your Facebook Page. Get topical. Whenever you create an update on Facebook, such as a discussion topic on a Page, choose topics that your intended audience is likely to search for. If you want to know whether your fans would be interested in a whole-wheat pizza crust option, post that question on the discussion board and point out some of the health benefits of using whole-wheat crust (think fiber). If you take the time to optimize your content, you see the benefits in your Page traffic and fan engagement. If people can find you in search results quickly and easily because you’ve posted interesting, engaging information, they’re more likely to return to your Page in the future. Future visits mean interested fans and fun interaction! Stories posted in the early morning or in the evening have higher engagement rates, because people typically check their Facebook feeds when they get up, get to work, or wind down for the night. Are you doing all you can to encourage people to like your Facebook Page? Okay, you’re not Apple or Taylor Swift, but you can think like a marketer and increase your number of fans, level of engagement, and interaction by employing some best practices in fan building. Email your fans. John has a client who received more than 3,000 fans in one week simply by sending an email to its rather huge email list. Do this; it’s very easy, and you may be surprised by how many new Facebook Page connections you receive. When you write this email, be very clear about what people can find on your Page that they won’t find elsewhere. Give them a compelling reason to like your Page. Promote your Page during a webinar. If your organization does webinars on a regular basis, make your Facebook Page the place where you answer follow-up questions. Run promotions on your Page by using a customized tab. If you own a photography studio, use a third-party app like ShortStack to run a contest in which people submit and vote on photos. Review your Page’s Insights on a regular basis. Insights helps you understand how your visitors are engaging with your content and keep track of what’s resonating and what’s not.